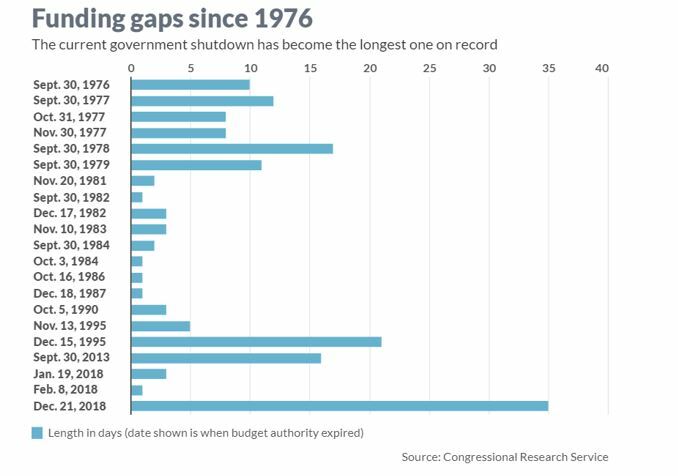 “At 35 days in duration as of Friday, the partial government shutdown has become the longest one on record, based on figures that go back more than 40 years. President Donald Trump on Friday announced a deal to end the shutdown, but that’s after it turned into a historic one while dragging on. It easily exceeded the prior record, which had been held by a 21-day closure during the Clinton administration that began in December 1995. While this is the longest, there is a long history of shutdowns. This may be surprising to many since the news coverage indicates the shutdowns are partisan affairs and partisanship appears to be rising in the past few Presidential terms. “The Trump administration now estimates that the cost of the government shutdown will be twice as steep as originally forecast. After 35 days, or 5 weeks, the White House estimate implies a 0.5% hit to GDP. But economists interviewed by CNBC expected that deep a hit only if the standoff lasted longer. “Mark Zandi, chief economist at Moody’s Analytics, forecasts a half a percentage point hit to GDP if the shutdown lasts through March, roughly a third of the administration’s new estimate. “We estimate (the shutdown) will reduce first quarter real GDP growth by approximately 0.5 percentage points,” Zandi wrote in a research report. “Of this, about half will be due to the lost hours of government workers, and the other half to the hit to the rest of the economy.” Zandi said his estimate could worsen if the administration can’t continue to triage the effects of the shutdown or if the administration can’t issue tax refunds. On the other hand, Ian Shepherdson, chief economist at Pantheon Macroeconomics, believes the combination of the shutdown and the tendency of the first quarter to be statistically weaker than the other three means growth could turn negative. With GDP already expected to slow, the shutdown could reverse the recovery that appeared to be underway in the economy. It’s possible the brief spurt in growth seen in the data could be ending. History also provides room for optimism. LPL Research recently studied previous shutdowns and provided a bullish summary of the past. “U.S. 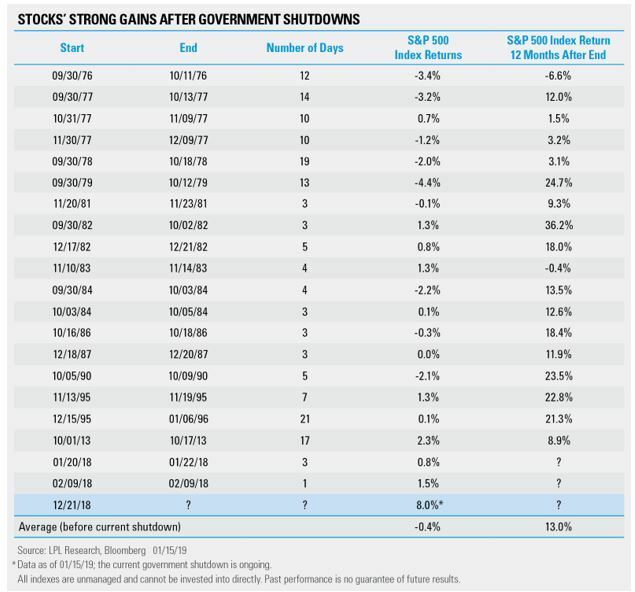 stocks have also historically fared well after shutdowns, showing that any economic impact wasn’t enough to derail market rallies. “It’s important to recognize, however, that the current shutdown has lasted for an unprecedented amount of time with no end in sight. The U.S. economy is also especially sensitive to a shift in confidence right now. Consumer and business confidence gauges have declined from cycle highs recently as negative headlines from the U.S.-China trade dispute and geopolitical squabbles have rattled financial markets and soured sentiment. Government employees missed their first payday of 2019 on January 11, increasing tensions and pressure for a deal before the U.S. economy takes a material hit. “Trade tensions have softened corporate demand, and the shutdown could eventually weigh on consumer demand,” said LPL Research Chief Investment Strategist John Lynch. It is important to note that we are in uncharted territory because the shutdown did last for an extended period of time and the effects were felt beyond Washington. Airlines are one example of the impact with The New York Times reporting. “It’s not just airport security lines and control tower workers that are affected by the federal government shutdown. Airlines, too, are being hit. Estimates are that the revenue hit could total $15 million for Southwest and $25 million for Delta. These revenue shortfalls could drive earnings below expectations and result in market weakness. Time added, “When government employees spend less, stores and restaurants that serve them suffer. So do landlords and lenders that do business with federal workers. Though spending and growth will rebound once the government reopens, most of the restaurant meals missed and hotel stays canceled will never be made up. No matter what happens in the future, we can be certain that investing will continue to be difficult. In fact, the future might be more difficult than the past but we do know that dividends will continue to be rewarding to many investors, just as they have in the past.